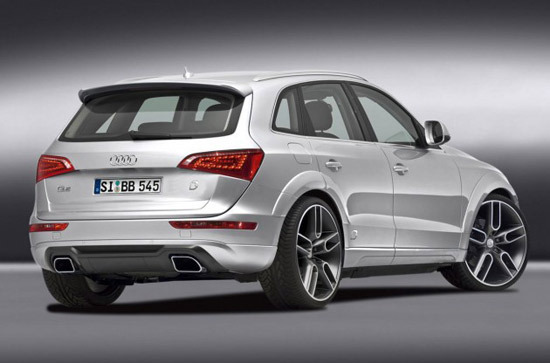 Car Tuning company B & B just releases several tuning stages for the Audi Q5 3.0 TDI, 2.0 TFSI and the new 2.0 TDI, reaching up to 325HP and 640Nm. Starting with the Q5 3.0 TDI B & B offers 3 tuning stages, starting with a electronic changes increasing the boost pressure by 0,15bar. In this stage the car gets up to 280Hp and 550Nm for the price tag of 1298 Euros. The second stage gets the car up to 300Hp and 600Nm. The third stage, by changing the injection, suction pipes, air flow and air cooling systems, this baby gets up to 325Hp and 640Nm. The tuning program for the 2.0 TFSI engine is built on 4 stages, with the first reaching the 250Hp and 400Nm by changing the electronic and boost pressure for 998 euro. The remaining stages are reached by setting a special exhaust turbocharger with changed airflow and a special air cooling system. To reduce exhaust back pressure B&B also mounts a sport exhaust system with a special down pipe as well as a high quality sport catalyst. To optimize the engine the car’s ECU gets reprogrammed. And for optimal oil temperature B&B installs a slim line oil cooler. This modifications for the second, third and fourth stages gives us 260Hp 295Hp and 310Hp with 465Nm on the fourth stage. For the 2.0TDI common-rail engine B & B also as some stages bringing the stock version of 170hp/350nm up to 200hp/400nm in the first stage and 220hp/420nm in the second stage with a starting price tag of 998 euros. Also available are sport springs in 40mm drop as well as several sport silencers. To build up an impressive appearance, exclusive wheel sets in 18″/19″/20″ and 22″ as well as an 14-parts including aerodynamic package are available for order.